Treating a child appropriately in the field can significantly increase their probability of a good outcome.Doing this requires more than a single “tool.” Handtevy is a system of care – a platform – that allows pre-hospital providers to treat critically ill & injured children quickly and effectively. Start to treat kids as proficiently as you treat adults. The Handtevy System uses age first and length second in order to determine drug dosing and equipment sizing PRIOR to arrival. No more math in front of Mom and Dad. Handtevy Mobile is custom to your protocol and ready to give you the medication dosing for each and every drug you carry. So go ahead… stay on scene, perform confidently and save more lives. Plus you look good doing it! Drips come with a high degree of complexity – and anxiety. Stop the madness – Customize your drips to ensure they are mixed according to your exact specifications every time. Do you remember this formula – Age/4 + 4 mm = internal diameter (ID)? We don’t either. Handtevy will display the size of every piece of equipment required for any sized child and turn this confidence and proficiency into results. You deserve it….and they do too. This is the fastest you’ll ever document a drug, its route and dose (in mL & mg), drips and equipment all with a single tap! 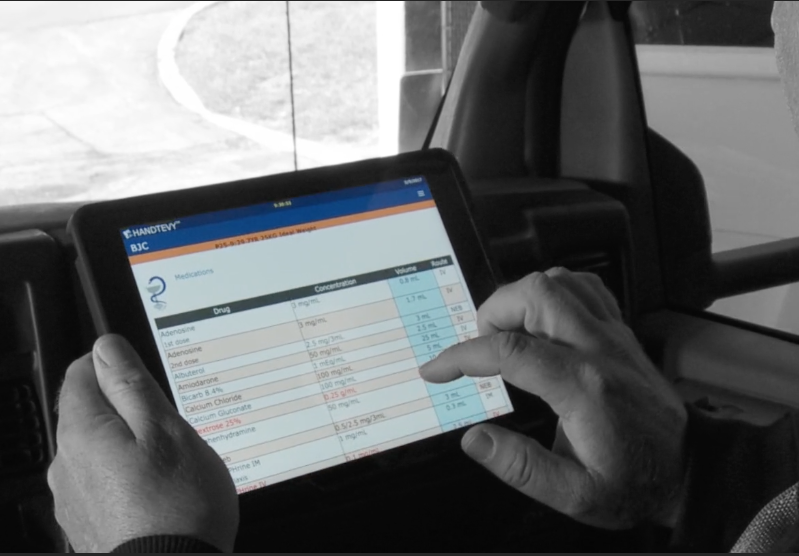 After the call, review the list and seamlessly integrate with your ePCR. Start to treat kids as proficiently as you treat adults. Handtevy uses age first and length secondarily to determine drug dosing and equipment sizing PRIOR to arrival on scene. No more math in front of Mom and Dad. The Handtevy team helps customize books and a mobile app, eliminating the need for complex math. The Handtevy will serve up the dose for each and every drug so you can stay on scene, perform confidently and save more lives. INTEGRATE RIGHT INTO YOUR ePCR! Handtevy’s integrated web service APIs ensure seamless integration into ePCRs in real-time. Let us show you Handtevy Mobile in action! And no worries…data is not stored on any device so it’s secure and HIPAA compliant. HANDTEVY PRE-HOSPITAL – How it works! There’s no time during a medical emergency to perform difficult mathematical calculations. Utilize Handtevy’s cloud-based medication management software program to customize medication & equipment guides, listing the precise volumes for any age patient. This one-time process, accomplished using our streamlined interface, leads you through medication, equipment, airway and electrical sections, and is tailored to your specifications. No worries…we got your back. Our expert team of pediatric physicians, pharmacists and clinical coordinators will be supporting you the entire way. Once the customization process has been completed, you will be able to activate your medication & equipment guides on a mobile platform. This client-only application is the first of its kind to utilize customized medication dosing on a mobile platform that allow providers to document in real time and integrate seamlessly into the patient’s medical record. Medication dosages and equipment sizes using either age, length or weight for premature newborns infants, children, adolescents as well as adults at your fingertips. The information can be accessed in airplane mode, and with a single tap, is automatically recorded and time stamped. Your daunting documentation days are over! Ready to be energized and excited to treat your next pediatric patient? Excited – Is that even possible? Yes! You will leave the Handtevy Course feeling confident that you’ll be able to provide the highest quality of care to every child on scene. It’s not just about the medicine, but how to effectively work with your crew while overcoming the emotional hurdles associated with pre-hospital pediatric care. Your job is difficult enough – let us lend a helping hand. CAPCE Accredited and CAMTS Approved. Once your customized app and pre-calculated dosing guides are completed and the education is rolled out, it’s time for the rubber to meet the road. Can you find your equipment quickly? The Handtevy backpack was custom designed for rapid use during a pediatric call. Stock your equipment into seven (7) age and color based pouches along with a printed version of the Handtevy medication guide and the always popular Handtevy badge buddies.